We have information about the Cricket Club in Grewelthorpe from the diaries of Bert Jackson who was a keen player. Bert was the groom, handyman and chauffeur for General and Mrs Dalton who lived at The Hutts, Grewelthorpe in the early 20th century. I have also found reports on Grewelthorpe club in newspaper reports. Grewelthorpe Feast.—On Saturday, the 4th Sept. the return of St. Bartholomew was celebrated at Grewelthorpe, when a cricket-match was played between eleven of Grewelthorpe and vicinity against eleven from Colsterdale and neighbouring townships. The game was won by the latter party. 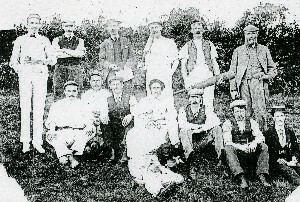 After the game a dinner for the players and friends was served up in excellent style by Mr. and Mrs. Jackson, of the Crown Inn, Grewelthorpe.—On Monday, another match was played by the townspeople and visitors, after which the races commenced, and were kept up with great spirit till the shades of the evening drew the company to the dancing-rooms, which concluded on Tuesday morning, not at a very early hour. Never were more people known in the village, and we are glad to state that the best of feeling prevailed, and something of that good humour existed which betokened the return of the olden times. Grewelthorpe 1st innings 50. 2nd innings 28. Total 78. of which E.Harrison [b. Hudson] got 3 [b.Hudson] got 4. R.Watson [cJ.Bonwell] 2 and [st Turner] 5. J.Graham [b.Hudson]1 and [b Harrison] 0. W.Jackson lbw 11. and [c.Pratt] 0.
not out 4 and [b.Hudson] 2. C.Watson run out.0 and [c.Pratt] 2. K.Malzead scored 79. The highest scorer was C Pratt with 21. From this report we can get the names of the players. in 1848. Bert Jackson’,s first mention was in May 1911 when he went with a horse to the Cricket club meeting in Masham. In September 1911 there was a match with Kirkby Malzeard at the Grewelthorpe Feast. Grewelthorpe won by 2 runs and all players had tea at Fosters. 30th Sept.1911. Kirkby Malzeard won by 27 runs. 24th November 1911. Bert had half a day off. There was a cricket club concert, probably in Grewelthorpe, it was a success and made £7 for funds. Bert took part in a farce called “The Dog in the coal cellar” with Miss A.Hardcastle, Miss Brown ,who Bert later married, H. Cookshaw and George Lofthouse. 16th Feb. 1912 A cricket club social and whist drive. Bert sang in the glee concert. 11th May 1912. Played Tanfield and lost by 18 runs. Bert took 6 wickets and bowled 3. 25th May 1912. Played Masham and lost by 28 runs. Bert took 3 wickets. 8th June 1912. Played at Grewelthorpe [v] Ripon. Lost. 22nd June 1912. Played Sawley. Grewelthorpe 111, Sawley 56. Bert took 3 wickets and 1 catch. 16th August 1912. Played at Kirkby and lost. 17th August 1912 Played Ripon YM and won by 2 runs. 31st August 1912. Played Masham and won by 15 runs. 7th Sept. 1912. Played Studley and lost. 29th November 1912. Cricket club whist drive. J.Leathley and G. Wood whist winners. B.Ashby won at dominoes. 17th May 1913. Played Tanfield at Grewelthorpe. G/T won by 36 runs. G/T 90. Tanfield 54. 24th May 1913. Played Winksley. Grewelthorpe won by 22 runs. G/T 63. Winksley 41. 7th June 1913. Played Stainley. Grewelthorpe won by 31 runs. G/T 59. Stainley 28. 23rd August 1913. Played Sawley away. Grewelthorpe won by 81 runs. G/T 108 Sawley 27. 30th August 1913. Played at Kirkby and lost. 4th Sept 1913. Played Kirkby at home and lost. 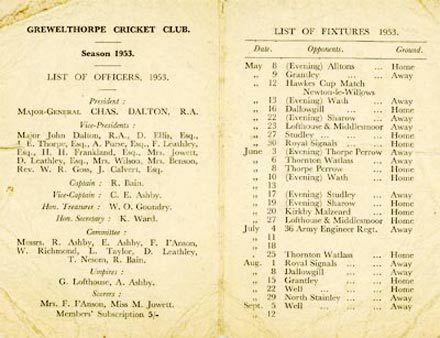 At the end of 1913 Bert recorded that Grewelthorpe had played 9 matches,.won 7 and lost 2. 8th October 1913. Cricket club concert. Miss J. Richmond’s sketch “The Area Belle” with Mr.J.Leathley, George Lofthouse, Bert Jackson, Miss A.Leathley and Miss Brown. 20th June 1914. Played Tanfield and lost. 22nd August 1914. Played at Well. Grewelthorpe 109 and Well 40. Won by 69. The war in Europe then put a stop to the cricket matches and Bert didn’t record any more until 1920. 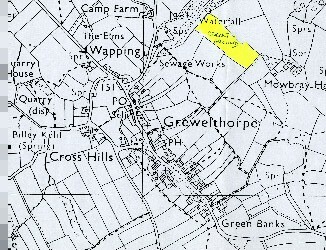 The map shows the site of the cricket field in Grewelthorpe. Near Hackfall woods. See report of meeting May 1923. 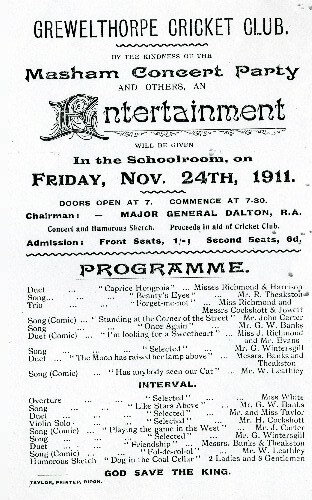 During the interval of the 1911 cricket club concert General Dalton gave a brief address. He stated that the club had been revived this year after being in abeyance for many years, and he remarked that there could be no two opinions as to the value of a club of that kind to a community such as Grewelthorpe. Cricket supplied a wholesome , high class form of recreation which must benefit all who joined in it both physically and morally. The funds of the club were in a healthy condition and it was proposed to build a small pavilion and to fence in the ground. For this the sum of £10.10s should suffice, and the Chairman added there was every hope from the enthusiastic way the tickets had been bought up for that concert and from the crowded audience, that a good sum should be forthcoming from the evening’s takings. The club had played 2 outside matches this season against Kirkby Malzeard club and in both had been successful, though after a very tough fight. The club were particularly fortunate in having an energetic playing vice president in Mr.Jowett and so excellent a hard working secretary in Mr.Bollands. General Dalton afterwords moved a cordial vote of thanks to those ladies and gentlemen who had given their services towards making the concert so great a success. Where all had done so well it was invidious to particularise, but he could not help mentioning Miss Jenny Richmond, the members of the Masham concert party, Mr. Cockshott and Mr.Evans from Kirkby Malzeard, who had come so far to help them. Their thanks were also due to Mr. Mills of Kirkby Malzeard, who had so kindly lent the scenery, and to Mr. Lofthouse on the part of the chapel community who had lent forms, which enabled a much larger number of people to be accommodated in the small schoolroom, also to Mr.Jowett for the loan of the piano. The Rev.F .Hewitt seconded, and paid a tribute to the way in which all had worked towards so successful a result – The vote was carried with hearty applause – Mr.Jowett and Mr. Bollands expressed their thanks to General Dalton for presiding, which was briefly acknowledged. An excellent table of refreshments was provided for those ladies and gentlemen who were taking part, being ably presided over by Mrs. Cookshaw who kindly gave her services free and to whom the members of the club tender their heartiest thanks. It is understood that £4 was handed over to the cricket club. 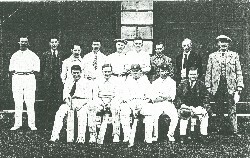 Picture shows the 1913 cricket team. Can anyone identify any of the players. O.Buckle:C.Bruce: Lobley: T.Wintersgill: ? : W.Jowett: W.Westwood. Front. W.Harrison: George Lofthouse: C.Binks: H.Binks: S.Carter. In May 1923 it was reported in the press that the new season opened with a meeting at Grewelthorpe. During the winter a new ground had been obtained. This was situated on the edge of Hackfall, see map, and the land belonged to Mr. Hawkins of The Low Ground. It was agreed it would make a very nice playing piece once the wicket had been got into playing order and all the players were looking forward to some very pleasant times in the new enclosure. W.Jowett: J.Patchett. Bert Jackson: J.Lambert: F.Leathley. George Lofthouse: J.Baul: R.Waite. Messrs G.Lofthouse: J.Thompson: R.Waite: F.I’,Anson: S.Atkinson. J.Patchett. A.Ashby. 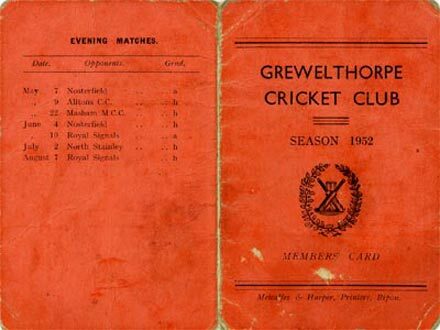 In September 1937 Grewelthorpe played Coverbridge on the Grewelthorpe pitch. They had a good win, 100 runs to Coverbridge’,s 82. The top scorer for Grewelthorpe was G Lofthouse. with 30 runs. The Grewelthorpe team was. A Chamberlain. Took 3 wickets. 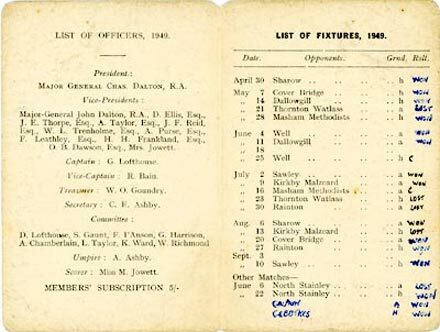 In April 1938 the Annual Cricket Club meeting was held in the Reading Room, Grewelthorpe. Elections took place. President. Captain Charles Dalton. Vice Presidents. J.D.A.Dalton. D.Ellis. J.W.Hawkin. J.F.Reid. J.Thorpe. E. Crabtree. W.L.Trenholme. C.Dent. A.Purse. A.Taylor. T.Lickley. The Secretary reported that there had been 17 matches last season. 8 had been won and 9 lost. The prize for the best Batting and Bowling was awarded to S.Lofthouse. and the Fielding Prize was awarded to J.Patchett. 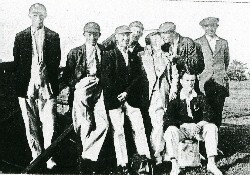 A meeting was held in the village school in July 1946 which was called for the purpose of reviving the village cricket club after the 2nd World War. There was a large attendance of men who were all keen to form a team again. They elected the vicar the Rev. Goss to act as Chairman of the meeting. It was unanimously decided to reform the cricket club as soon as circumstances permitted it, and the question of a Cricket field was under consideration. It was agreed that the committee should remain as it was in 1939 with the exception of the vicar and Mr S. Gaunt. Les Taylor tells us that the cricket club folded in the 1950’,s because they couldn’,t find a good enough ground to play on. They played for a while up Ilton Lane but couldn’,t get the field they wanted near the vicarage. Can anyone add to this information. Also can anyone else contribute to this article with more photos or information.